Place the Nespresso coffee and sugar in a large jug and mix to dissolve the sugar. Add half the milk and mix to combine. Pour into an ice cube tray and freeze for 4 hours or until frozen. Meanwhile, to make the chocolate fudge sauce, place the chocolate and cream in a small saucepan over low heat. Cook, stirring, until the chocolate is melted and smooth. Set aside. Place the coffee mixture in a blender. Add the ice, cream and remaining milk and blend until smooth. Divide the fudge sauce into glasses and swirl. 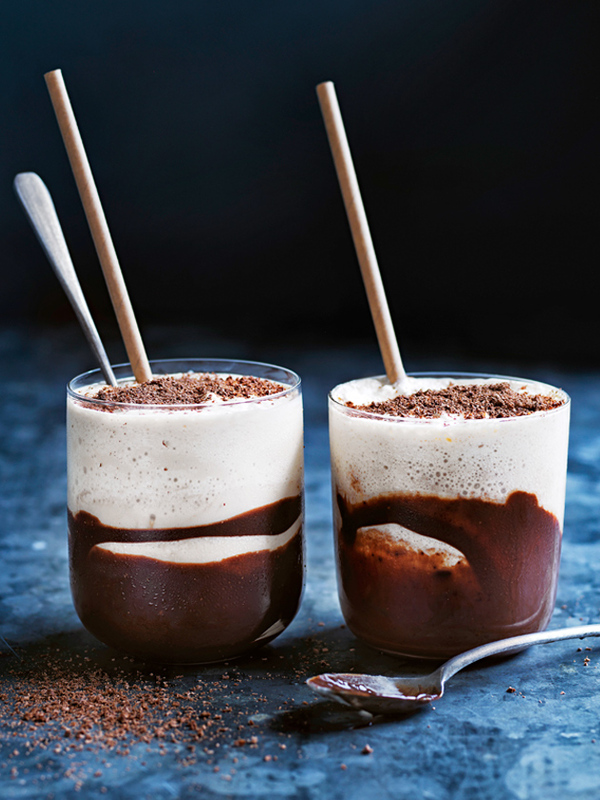 Top with the coffee frappe and sprinkle with rated chocolate to serve. Serves 2. Tasting note: If you are short on time, this delicious treat could also be made without freezing the iced coffee mixture. Simply blend the full-bodied Leggero On Ice coffee with the sugar, milk and ice for a quick, refreshing drink.